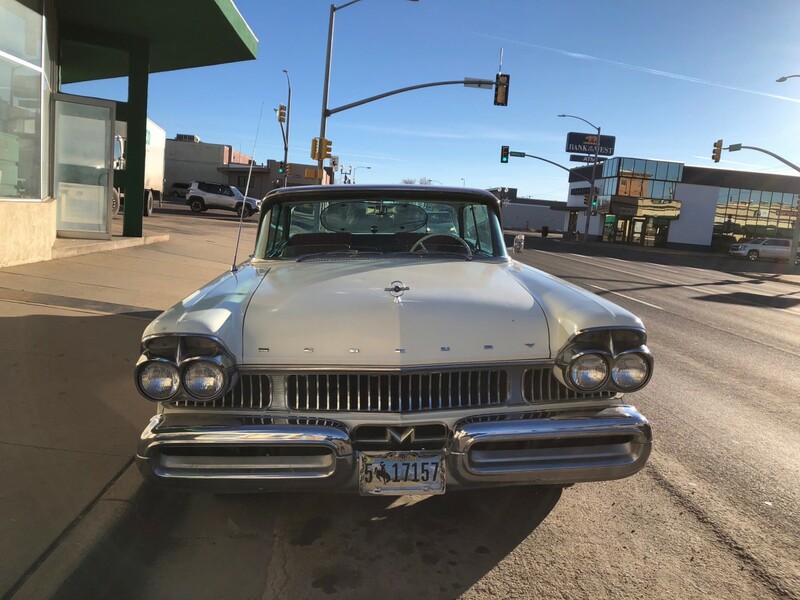 With it being such a dry, sunny day it seemed appropriate to pull the old Mercury up to the curb so you could get a better look at her before we go for a joy ride around town. There is so much eye candy here. We all know – even if darn few will admit it – there are only two things in the automotive kingdom better than a 1950s era Mercury; those two things would be a 1960s Mercury and a 1970s Mercury (except the 1979 Marquis but we won’t talk about that). So climb in and we’ll fire up the old Y-block to take a look at this third best automobile of all time. You will certainly enjoy the roominess and ambiance of the backseat. Either will work well for our trip as this old Montclair has a lot of glass making visibility nearly as unencumbered as walking around naked. But there won’t be any naked people allowed on our tour as those seats are black and it’s unseasonably warm out today. Before we get started on this voyage, there are a few basic things to remember. Just like the driver gets to choose the station on our monaural AM radio, the term Y-block is being used interchangeably. The standard engine in a 1957 Mercury was the 312 cubic inch Ford Y-block. The optional engine, the engine we suspect is throbbing away just in front of us, was a Lincoln Y-block of 368 cubes. If you have a Mercury, opting for an engine with 415 ft-lbs of torque at your beck and call is a natural. Anything less is simply inferior and undesirable. The base 312 isn’t exactly a limp noodle as it is rated at a remarkable 255 gross horsepower. The 368 is still preferable as this is a 1957 model, built at a time when more of a good thing was a good thing. There are fundamental differences between the Lincoln and Ford Y-blocks, one of which is the Lincoln Y-block was introduced in 1952, a year prior to the Ford Y-block. The bore spacing of the Lincoln engine is 117.6 mm with a deck height of 277.9 mm, which is taller than the Ford engine. 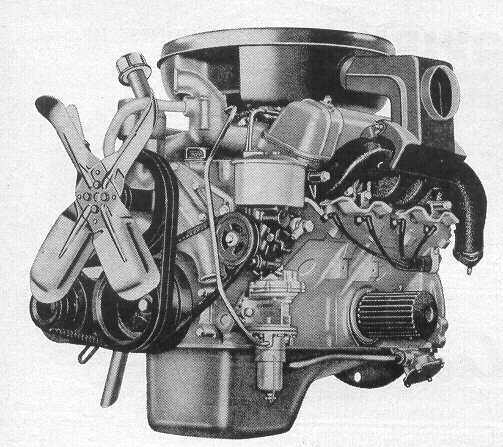 Lincoln’s Y-block would be the basis for heavy-duty truck engines for a brief time in the 1950s. The very first Ford engine with a displacement of 302 cubic inches was derived from the Lincoln Y-block and used in trucks. This predates the Windsor based 302 by well over a decade. We won’t discuss the formidable but unrelated Coyote family based 302 that came along in the 2010s. Any mention of the Chevrolet 302 would only confuse matters. 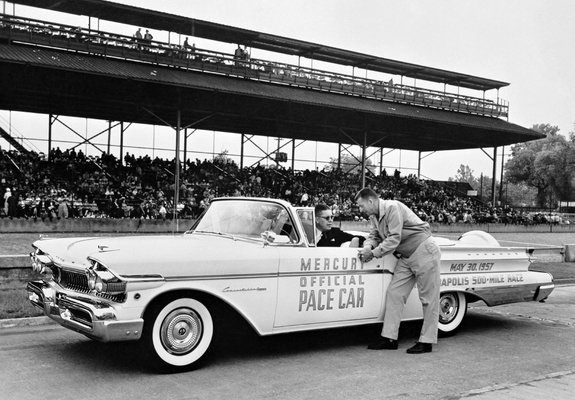 Another rule to remember is even by Mercury’s superior and unparalleled standards, the 1957 model is special. How so? Take a look at the fabulous front of our winged messenger chariot. Now gaze longingly at the front of the mid-range 1957 Mercury Montclair as found in the brochures. See any distinct differences – other than the pink paint? 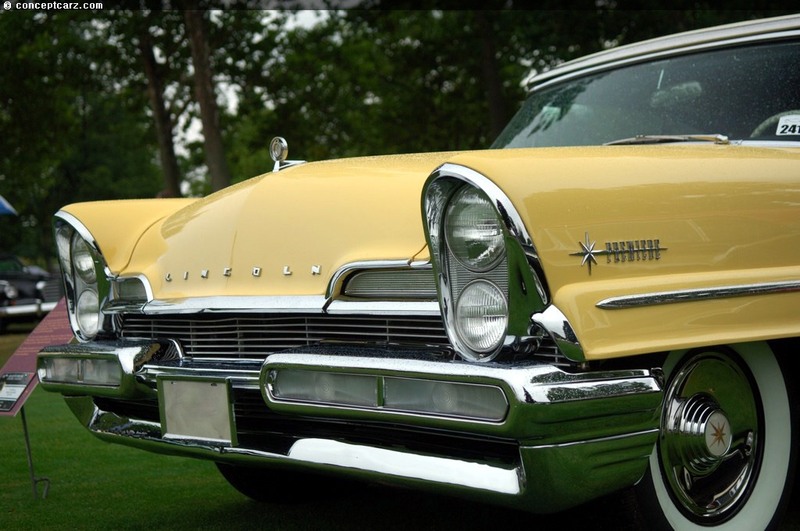 1957 was a time of transition for automobile manufacturers due to some states relaxing standards on the number of headlights a car could have. 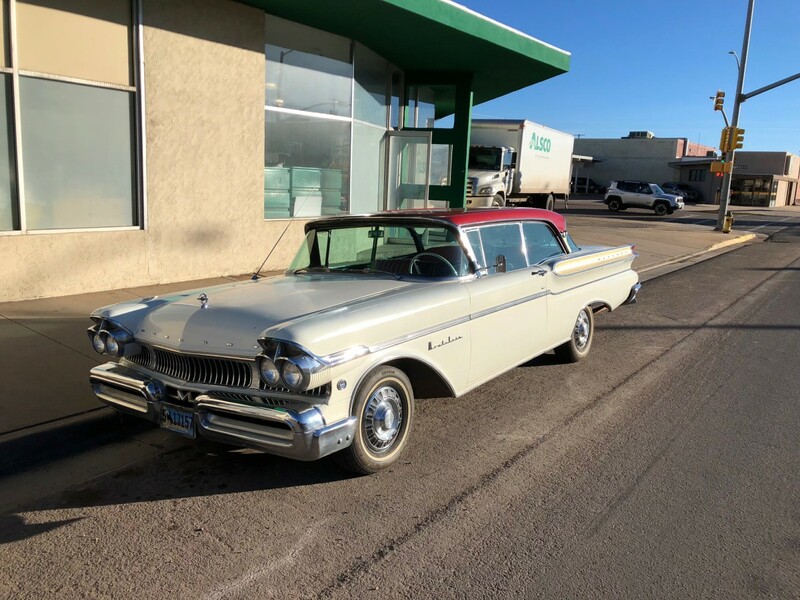 It’s a confusing thing, but suffice it to say the transition completed itself and four headlight Mercurys came about later in the model year meaning just under one-third of 1957 Mercurys had four eyeballs. When you get back home from our ride, here’s some trivia in which you can amaze your friends and neighbors and maybe even let you hook-up with some hottie….the Montclair name on the two light models is toward the front and top of the front fender. On the four light models, the Montclair name is behind the front wheel. See how this helps make our mid-level Montclair special? There is a fly in the ointment to this phenomenally awesome Mercury as there is a chrome laden appendage on the four-eye models that would be shamelessly plagiarized by Studebaker in 1958. See that chrome bezel at the front of the fender? Mercury had to do something to cover the expander required for the quad headlights. So while Studebaker would later do the very same thing, Mercury exercised infinitely more finesse as only they could do. But saying they did a good job is still like saying someone’s parasitic limb has nice muscle tone. Finesse wasn’t the only thing Mercury exercised in 1957; independence was the biggest muscle Mercury developed that year. 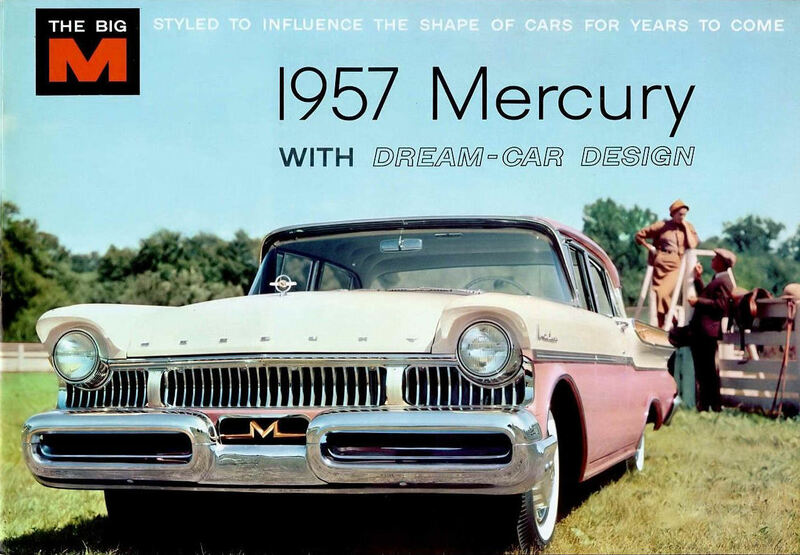 For the first time, Mercury had it’s very own all new body shell so it was no longer a Ford on steroids or an anorexic Lincoln. Some called it heavy and contrived looking; one report talks about the front bumper weighing 678 pounds. That bumper and the rest of this 3,900 pound car was purposeful. It wasn’t all hat and no cattle. Ford was moving the Mercury upmarket to make way for the Edsel in 1958. 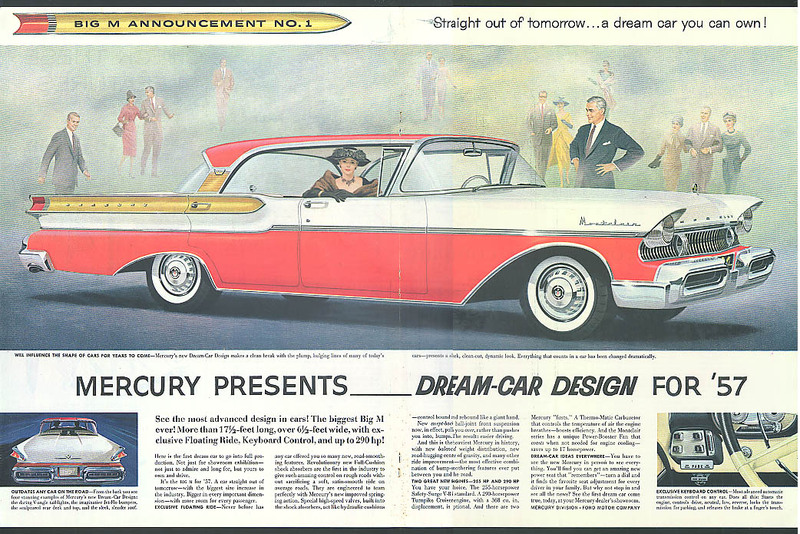 Higher trimmed Edsels would utilize the Mercury body shell during its inaugural year, so Mercury was obviously thinking ahead. 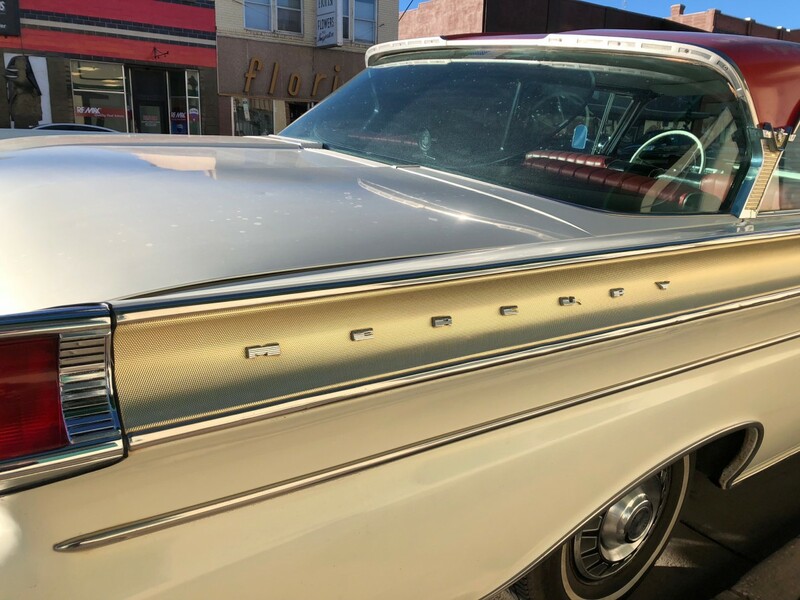 Upmarket was definitely a trajectory reflected in how most Mercurys were built at that time, what with Ford thinking Mercury should sit between Edsel and Lincoln in their burgeoning hierarchy. So Ford had a brain-cramp when aiming for the sky. It happens. 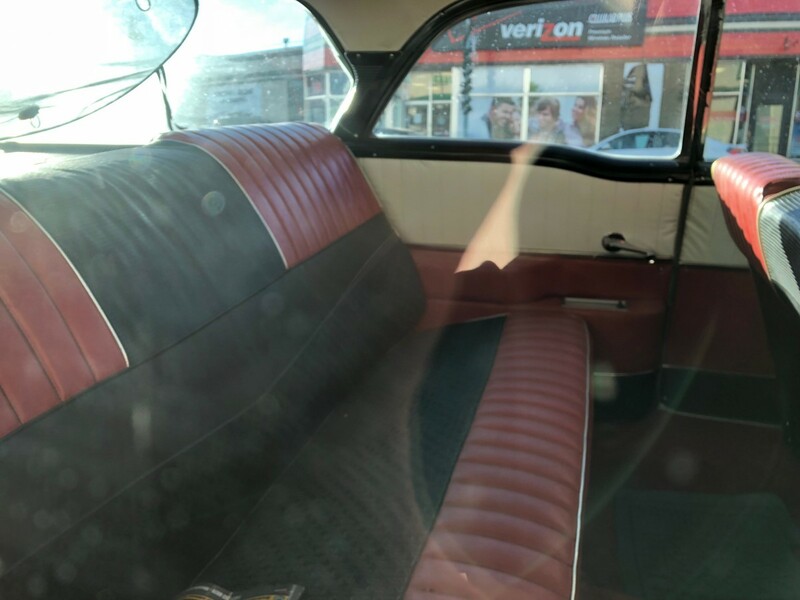 When you climb in, and it’s really obvious for those of you sitting up front, you likely noticed this particular Montclair is a shiftless car. 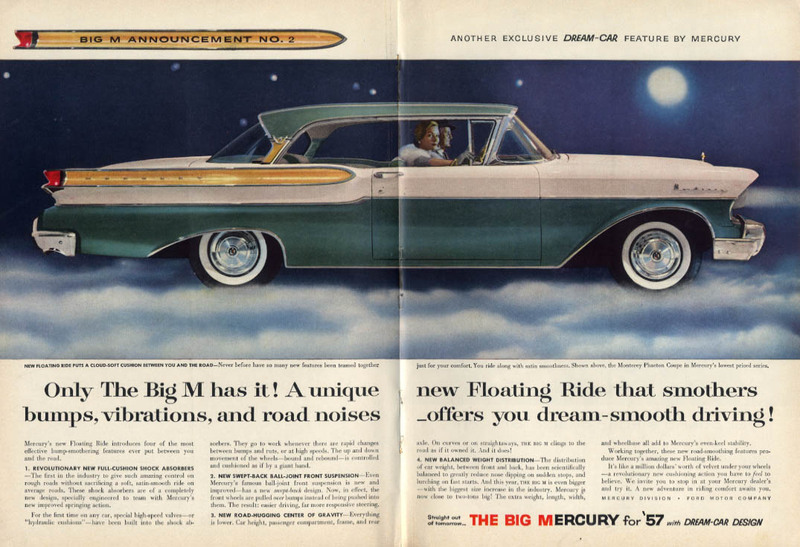 In 1956, most Mercurys were equally shiftless with just under 90% of them being built with an automatic transmission. For 1957 the number of shiftless Mercurys jumped to over 96% with just over one out of every 100 having a stick with overdrive. A 368 powered Montclair with a three-speed and overdrive would be a fun car. It would also be as rare as toes on a horse. In case you forgot, we are in southern Wyoming. With a bunch of us packed in here, it can get a trifle warm and that leads to our next rule. If you get hot, roll down the window; there is none of that sissified conditioned air in this Mercury. No sir, air just wasn’t a thing as the number of 1957 Mercurys with air conditioning was comparable to the number built with a stick and overdrive. If you’re hot, just roll down the window. It won’t get hot inside until we get stopped in traffic and with this being Wyoming, well, that won’t be a problem. Sure a person could get air, but…. 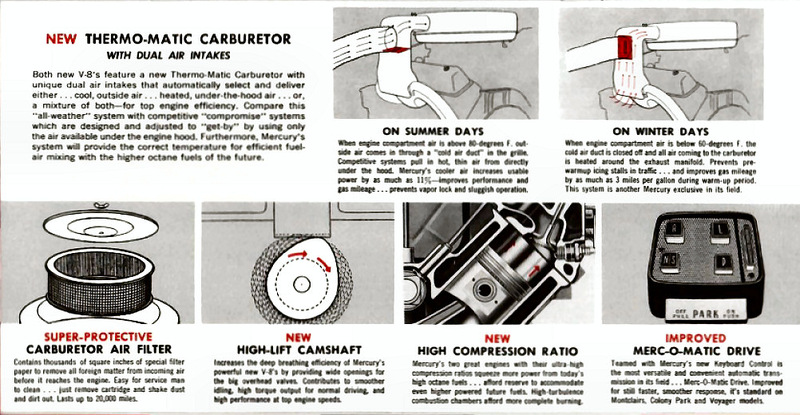 Mercury put more emphasis on their Thermo-Matic carburetor – with dual air intakes!!! With a Thermo-Matic carburetor and a Merc-O-Matic transmission, could life get any better? Probably not. The only way this Mercury could be any better is if it’s name was emblazoned in gold down the side. Oh wait; it is. Despite the sheerly awesome amount of euphoric Mercury utopia we are experiencing, everything at Mercury wasn’t all bobby socks and poodle skirts. Sales dropped for 1957 despite what was a distinctly new car. The market rather showed its backside to our desirable Mercury. But that makes no difference now. We’re hitting the starter with the goal of opening the secondaries on our Thermo-Matic. You can’t just stand here at the curb. Anybody remember Inger Stevens driving a 1959 Mercury Montclair in the Twilight Zone episode “The Hitchiker”? yes, and they kept switching cars – in scenes it was a Ford. 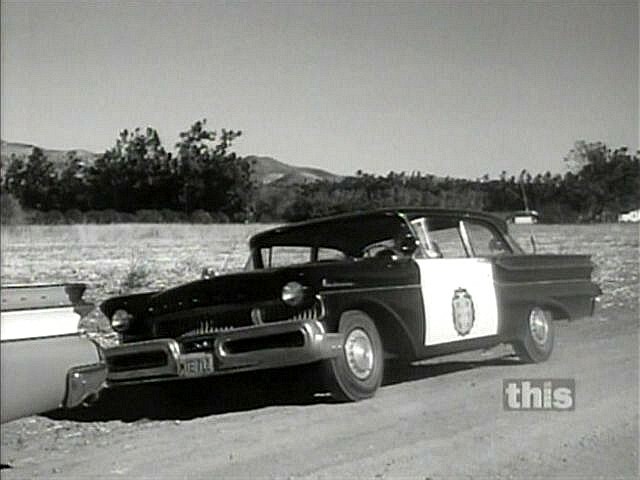 I always wondered why they cut out the front vent window on the ’59 Merc when they filmed this. Two beauties in one episode! Well, now I’m confused about “memory seats”. The brochure pics show a memory seat option for large Mercurys but I thought Cadillac was there first with the Eldorado Brougham. The EB began in ’57. This car is just so . . . Much! Which is not a bad thing. One of the reasons these sold so poorly was because of some big time price increases. The Montclair 2 door hardtop jumped by almost $500 from 1956 (when it had listed for $2765), so an increase of 17%. 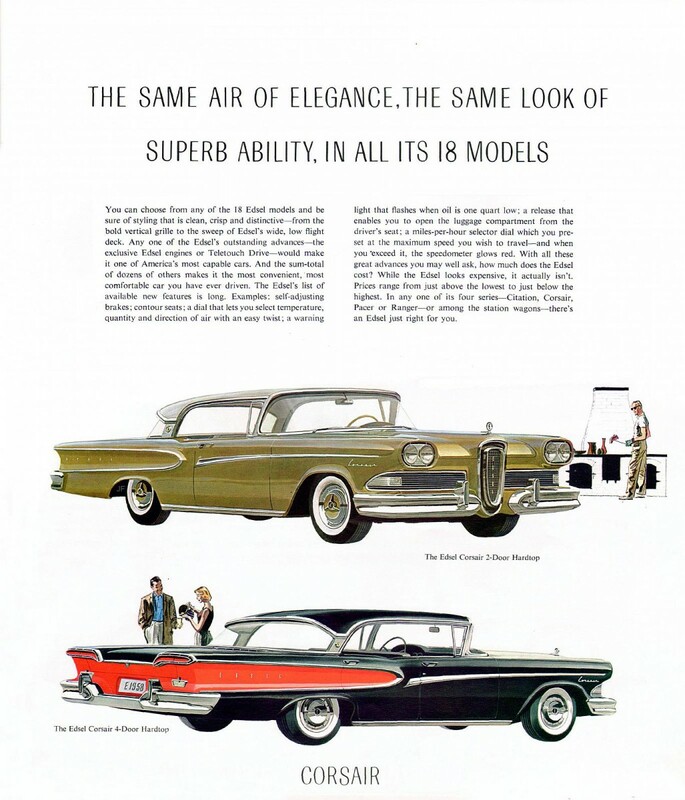 They were clearly trying to make some room for Edsel, but there was no Edsel yet. Yes, the headlight pods. All the chrome disguises them better from the side than Studebaker did, but the way the lights hang low to fit under the eyebrow is just bad. These Mercury designs started with a nice shape but the front and rear ends were just badly done. Let’s not forget the most famous 57 Mercury. I actually rather like their solution. 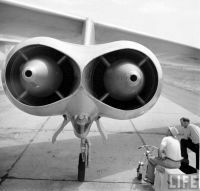 They were obviously inspired by the B47’s engine pods and its pylon. This one is pretty famous, too. It is from the syndicated television program, “Highway Patrol” starring Broderick Crawford. After its first two years, in which ZIV Productions used real California Highway Patrol cars with generic door badges (1955 Buicks, and a few 1954 Oldsmobiles), the cars were obtained by manufacturer loan; but accuracy as to year and make were largely maintained. Note that the car the officer ‘stopped’ is also a 1957 Mercury…FoMoCo apparently negotiated “product placement” into the contract. I have seen several episodes with late 50s Mopars as well. That was a great show for car spotters! 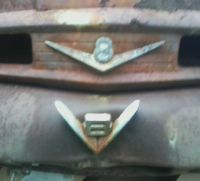 And that weird eyebrow gap would resurface in the ’59 Imperial for no apparent reason. I’ve always wondered if Bill Schmidt had a hand in that Reminded me a bit of the last Packard designs. It seems like about this point that everybody in Detroit for experimental with headlights. Not only were they going to switch to quads, but clearly they needed to be placed differently. Then after a couple of years of weirdness everbody got a memo that said “Just move them down a little and stick the grill in between”. Possibly Exner was out sick the day the memo arrived. “With Dream-Car Design!!…”. Some of my nighttime dreams have had questionable plots, but I do like this car on some level. I’ve always liked the monogrammed “M” built into the front bumper. Jason, great piece, and Jim Klein, equally great photos! It’s Mercurys that were Mercurys instead of badge engineered Fords that I love, almost as much as Jason. When I was a kid, I would spend many weekends at my father’s foster mother’s house way out in rural PA. Aunt Mary never had a car so trips to church were made in a neighbor’s Mercury. 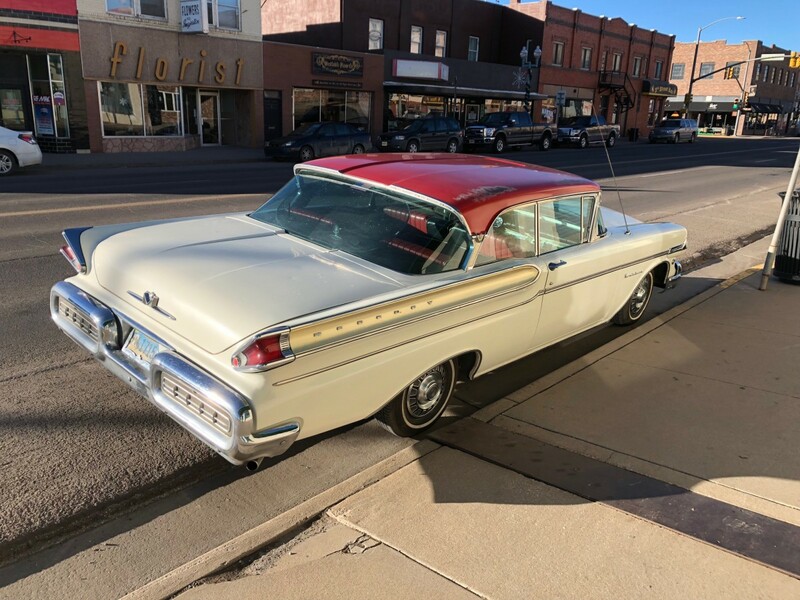 The neighbor had a sucession of Mercurys over the years, usually the lower line or middle line models…depending on what the friendly, local, small town Ford/Mercury dealer had in stock by way of a 4 door. 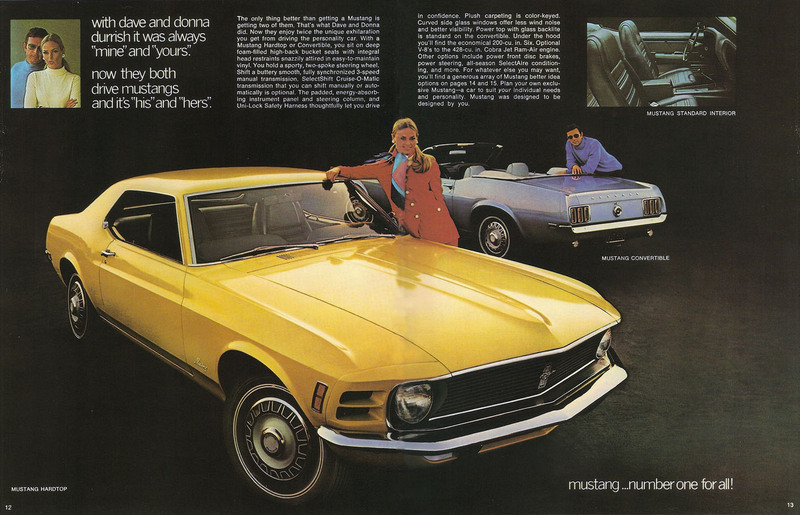 1 or 2 may even have been hardtops when that was what was in stock. I don’t remember the years quite as well as I remember the colors. I think the 1st one we rode in might have been a 57 or 58, perhaps black…or black and white. There was a 61 or 62 that was that dusty rose color. Nothing ever flashy, yet Mr. Cain obviously liked the idea of standing a bit away from the crowd. Me? 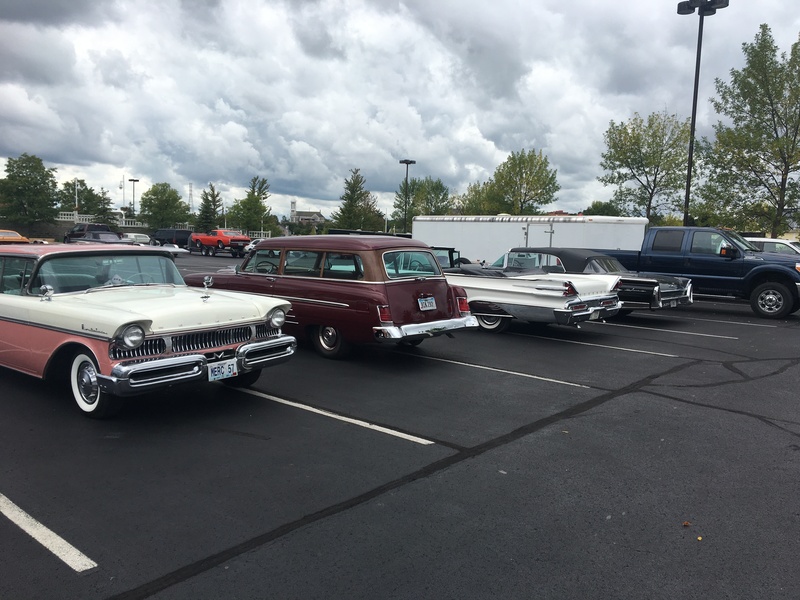 Friends of my parents had a 59 wagon, and that is my favorite 50s Mercury what with it’s black exterior, red interior, and only Ford company hardtop wagon styling. My 2nd favorite Mercury from my childhood is a classmate’s 55 Mercury woody wagon. My family had a 55 Ford Country Sedan the same red but the two were about as similar as…cottage cheese and blue cheese. These cars are truly monumental. Monuments to an era best forgotten. A detail I noticed is that, after a bit of a search of other pictures, I found the turn signals on two-headlight grilles. They’re on the grille mounted vertically. When the four-light cars moved them to the headlight eyebrows, the verticals in the grille became ribbed metal trim, curving inward with the grille instead of outward from it. I love these old Mercs from before my time. My father was a big fan of Mercurys for reasons I was never able to discern. I grew up the same way, my first new car was a Mercury (Fox body Capri) and I had several over the years. 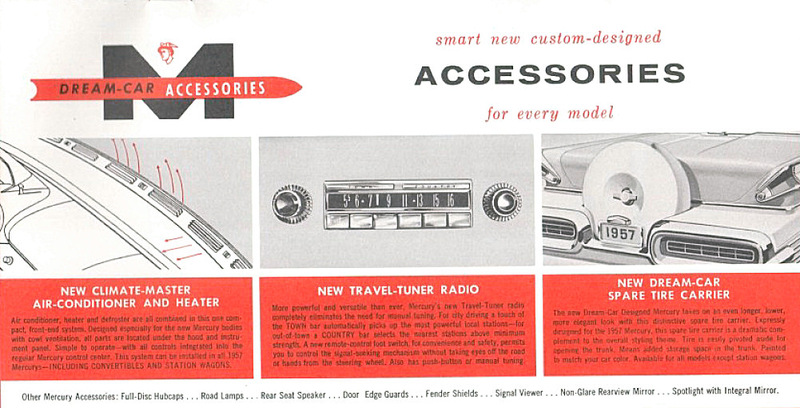 Who knows, maybe we can go back to air conditioning units hung under the dash again? There is a young guy on YouTube who goes by The Corvette Ben. He is mainly into Corvettes (as you would expect) but has a thing for rescuing derelict old cars and getting them back on the road. He is currently in the middle of a project with a 1959 Mercury Monterey sedan that has not run in years and years. The car has had a lot of issues so far but he has kept after it. I hope he sees it through. Norm…I respectively disagree. I was born in 1953, and can remember these cars so well. I’m glad that we have folks out there that can appreciate, and preserve such wonderful vehicles. likely see it again this morning and can now add to my musings about it based on what I learned here…. And I likely never will… (-: I don’t think I’d ever go looking for a “classic” one (to own, that is), the only oldish one that I sort of like would be the original Cougar but if that impulse struck me I’d probably just go Mustang. Sadly the one that stands out the most as probably being a good car is the first generation Mercury Tracer which probably just caused you to have a heart palpitation. Ok, the Marauder wasn’t all bad but kind of a pale response to the Impala SS. They are fun to read about though and some, such as this one, sure look interesting. A fine piece of writing, Jason. Jim, were you in Laramie in January, 1963 when it reached 50 below zero? Thankfully no, my mom would have been around 15 at that time in northern England and nowhere close to being a teen mom… 🙂 Her little bundle of joy wouldn’t arrive for another six years. Air conditioning in a car is definitely not needed in Laramie. Elevation is over 7,000 feet. One is more likely to need heating at night in one’s Mercury than cooling during the day – even in July. Over the hill in Cheyenne, at 6,000 feet plus, aircon in a car is used but not really needed; it is fun to drive with the windows rolled down. Wow, leave it to the Marketing guys to come up with the idea to highlight a thermostatic fan clutch! Rare time when the Engineering staff agreed and designed an instrument panel indicator. Keyboard Control is nice too. I knew Mercury had a problem after we arrived in the US in 1960, as these ’57-’59s were might thin on the ground. 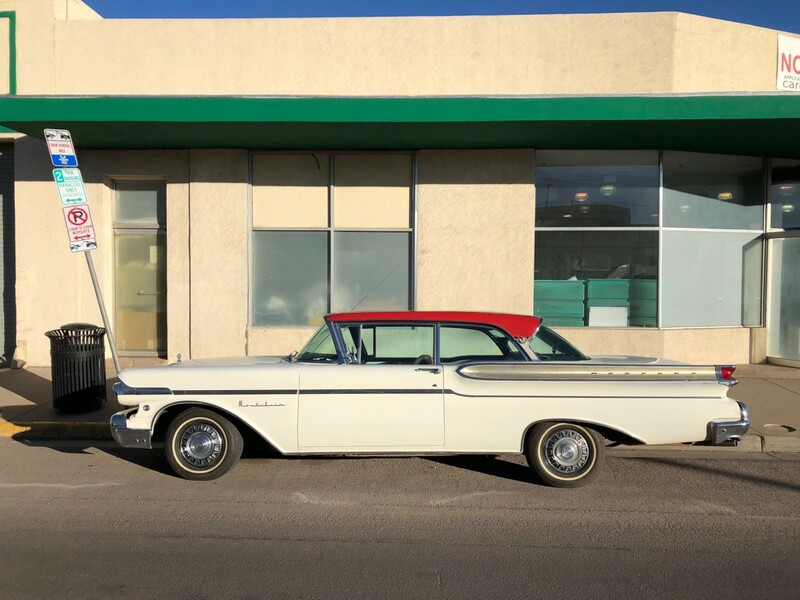 But there was a splendid ’59 in a carport on my walk to school that I could check out to my heart’s desire (walking on other folks’ lawns and driveways and even garages was a lot more tolerated back then, especially by kids). That ’59 was a revelation; wild! Minor detail: Mercury also had a unique body in 1949-1951; in ’52 they went back to a Ford shell. Mercury also had its own unique body shells for 1959-’60. Although based on the Ford shell for 1955-’56, Mercury did field its ’55 Montclair sport sedan and ’56 sport sedans and Phaeton four door hardtops which were as unique a body as Mercury was ever able to create on the Ford basics. I was referring to the period before this ’57. Going further back to the origins, the 1939-’40 Mercurys have their own unique body shells not shared with Ford, that came for 1941. It was either Murray or Briggs that built the bodies for the first two years. Most attractive were the Sedan-Coupe Type 72 with its narrow, chrome window frame as seen on the Lincoln Continental coupe, and the 1940-only Convertible Sedan Type 74. Although they shared that 49-51 body with the junior Lincoln. I know Mercury shared the 57-58 body with the 58 Edsel, but I believe the 59-60 Mercury body really was unique. Being a Mercury copywriter would have been a blast. But only for the biggies; the mid-sized and compacts always seemed so sarcastic. Of course Mercs were very forgettable compared w/ many many. And I believe that is a reason for their relatively low esteem among collectors. The only real collectible Mercs are the early 1950's that were chop-topped and the original Cougars. Otherwise Mercury was pretty much always an uglier Ford. 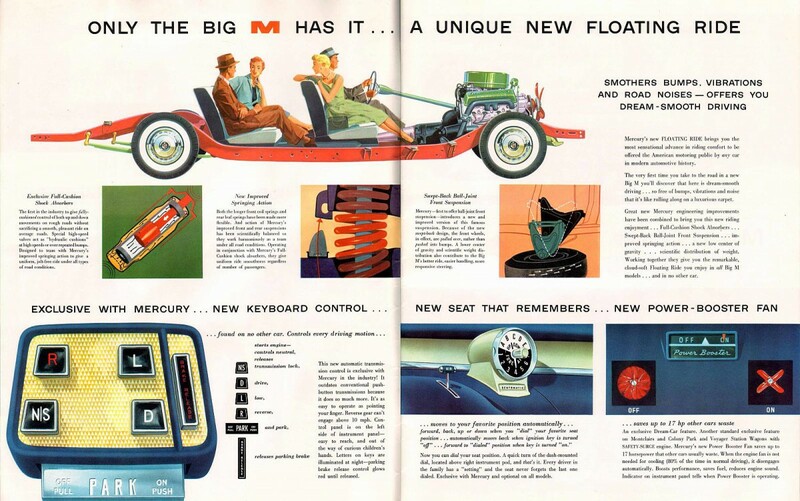 The over-the-top styling of the Dream-Car Design inspired Big M was just a manifestation of the unbounded optimism of the times. It seemed as if anything was possible and more was more when it was presented as thoroughly up-to-date and tastefully modern…even if it really wasn’t. Personally, my ‘bad’ taste was formed as a kid exposed to these in the late 1950’s-early 1960’s. 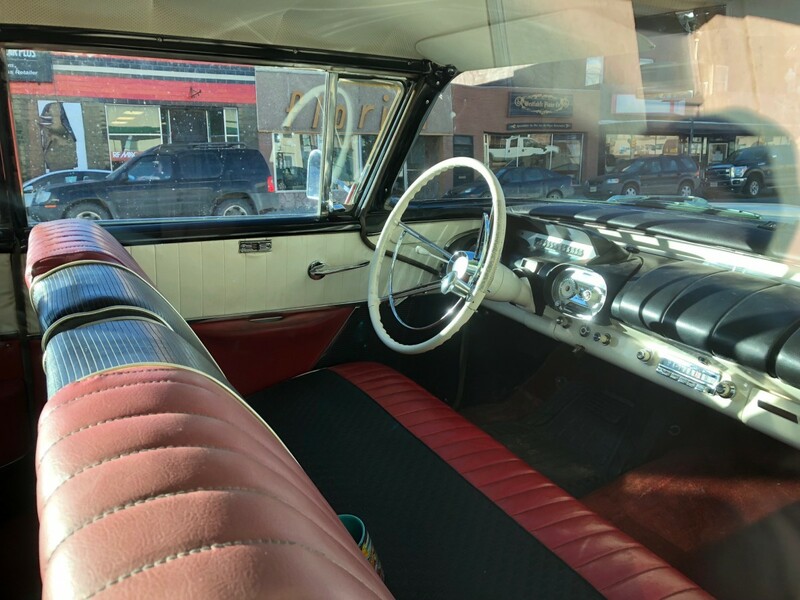 Our local Ford dealer had a black and white ’57 Monterey four door hardtop with matching vinyl interior on his used car lot when my father was thinking about trading his plain-Jane ’54 Ford Mainline six cylinder stick. I checked out both front and rear compartments, played with the optional power windows, enthused over how great it would be for a family car, so roomy. My father was unmoved by my argument: “uses too much gas, more expensive to fix when something breaks down”. So we ended up with a plain-Jane ’60 Ford Fairlane six cylinder stick. 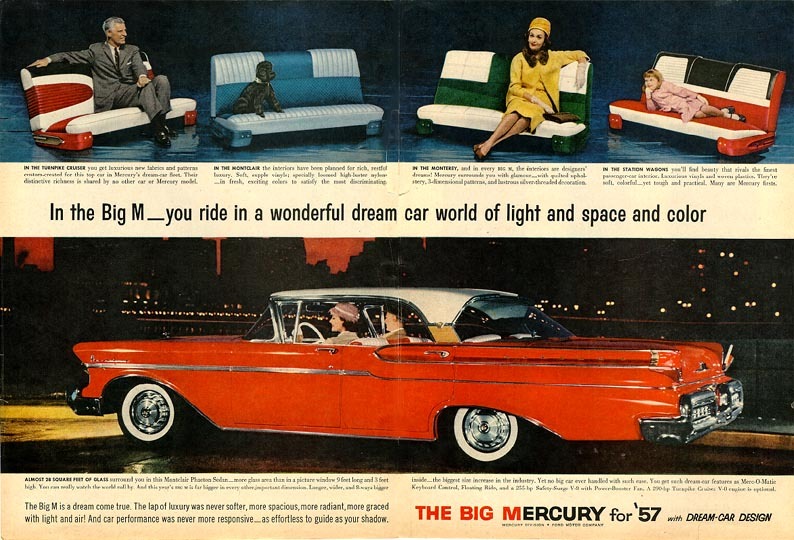 It sure lacked the glamour of that ’57 Big M! Oohhh..what a BEAUTIFUL car. Sometimes feel bad I wasn’t born 30 years earlier when I see one of these. But I’m permentaly ensconced in my 70/80’s rides. I was born just after the ‘63 models were released, so I think it odd I never saw a late ‘50s Mercury growing up. I did read about them in George Damman’s 50 years of Lincoln Mercury – a 1971 book I checked out many times from the Public Library and remember that Annette Funicello drove a impressive ‘57 BIG M Convertible on re-runs of “The Mickey Mouse Club”. Nothing, except the Edsel, screams “The age of Gorp” quite like these. I love it. If I recall correctly, the small round emblem with blue background on the front fender below the headlight pod indicated the car has the “Turnpike Cruiser” engine option which is the 368 ci Lincoln unit. I defer to Mercury experts to confirm. As someone who was a kid in the 1950’s, I can’t overstate how being impressionable (and 4 feet tall) could cause you to lose yourself in the endless detail of cars like these. My first drug-like experience. 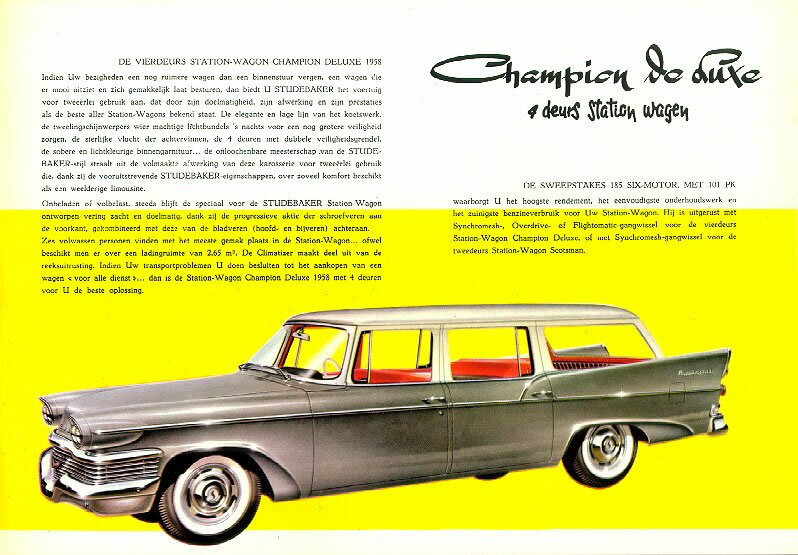 The first car I can remember Dad driving was a black 1957 Mercury Colony Park station wagon with single headlights. He owned it until he bought a 1961 Mercury Monterey – in hindsight, that seems like a downward step. I remember as a small child a trip to a Missouri campground in the wagon on a stifling hot summer day. No A/C. I and my two older brothers were three across in the backseat with our shirts off (the littlest brother of course always got the center seat) while the family Airedale was standing up in the back panting away. The dog was copiously drooling on my shoulder. Every time I tried to push him away, he came right back and went on with the panting and drooling. I don’t think it’s all that desirable. These ‘57’s would have been just rolling out of showrooms when I was born in late 1956. Thanks for a great post Jason. After about 58 years of pre-and post-Internet car spotting, I learned something new here … that some ‘57’s had 4 lights. I always assumed, even back in 1960 or ‘61 when I started to be aware of these things, that 1958 was the year for quads. However, as dramatic as this car is … and this might be a cliche … but there is really nothing like a Mercury ‘49. BTW, am I the only one that sees 1968 Pontiac in the front and rear lower bumpers? Another fine piece of writing, Jason. Jim, were you in Laramie when the temperature reached minus 50 in January, 1963? I didn’t fully appreciate until now just how, um, challenged, FoMoCo was with headlights in 1957. The ’57 Fords were beautiful cars except for their bug eyes. Both the single and dual headlight Mercurys are pretty rough. They sure help make the ’57 Mopars the lookers of the season. ‘cept the Pontiacs were handsome cars unlike like the slow-selling Mercurys. “…built at a time when more of a good thing was a good thing.” I DEFINITELY get the humor in that–LOL! How about 2 V8 emblems off the hood of a salvage Ford F-2? Spotted in my hotel parking lot during a recent sales trip. Obviously some kind of Mercury fanboi get together. My company Chevy was quite out of place.